Renovations and sales at Potomac Place Tower (PPT) condos, located at 800 4th Street, will now continue since local developer Monument Realty has been able to find a new lender to finance the project, according to a press release on Monday. Swedbank, AB, a Swedish-based bank, is the new lender on the project. Back in December, Southwest...TLQTC first reported on the work stoppage at the condo conversion project, due to the bankruptcy of Lehman Brothers, and the subsequent liens placed on the property. The news of PPT restarting sales comes just a couple weeks after Waterfront Tower, a new condo conversion project nearby, began marketing. Perhaps the thought of having a competing condo project in the market helped negotiations move along for the developer and the lender. Natasha Stancill, Director of Marketing at Monument Realty, tells Southwest...TLQTC that the renovations at PPT should be complete by the first quarter of 2010. Approximately 15 units in the North Tower and 100 units in the South Tower are available for occupancy within the next 30-45 days. Another 100 units in the South Tower will be available for occupancy by year end. The final 35 units in the North Tower will be available in the first quarter of 2010. Prices range from approximately $180,000 for a studio to approximately $330,000 for a two bedroom. 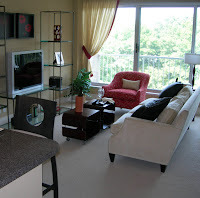 Below are a couple of photos of unit interiors in a model unit at PPT, courtesy of Monument Realty. 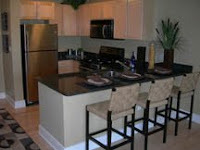 To the left is a photo of the kitchen and on the right is a view of the living room with a balcony. If you happen to be viewing the units, do ask to see the special duplex-style 2 story units (I think there are only 4 of them in the whole North building). They are spectacular - built out of two previous studio apartments with staircase. And if I recall, pricing is somewhere in the mid 300s...1BR but a great value for such a unique property in the area. As for the rest of the units, they seem to be well-finished, but I just couldn't get past the honeycomb facade on the balconies (protected for historical value, apparently) or the lack of W/D in the unit. But prices have dropped quite a bit. way overpriced. the kitchens are shoddy. the cheap formica counter-tops are hideous. Bathrooms are tiny, too.